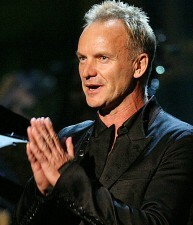 I told people a year ago, when Sting did his wonderful “Last Ship” concerts at New York’s Public Theater, that the show would have a much better chance on Broadway if Sting himself were in it. (Not as the lead character, for which he’s too old, but in one of the lesser parts, as a kind of glorified cameo.) Well, according to Michael Riedel in today’s NY Post, I was right. The musical’s sales are slipping, and all the “experts” would agree that it would sell more tickets if Sting went into it. In other theatre news, Kristin Scott Thomas will play The Queen in Peter Morgan’s play “The Audience,” next spring in London. While Kristin is on the throne across the ocean, Helen Mirren will be reigning, in the same play, on Broadway. Sting has said that he was inspired to become rich and famous by seeing the Queen as a boy, so maybe he could write up that scene, insert it in “The Last Ship,” and have that be his cameo.